PokerTime is licensed by the Lotteries and Gaming Authority of Malta and displays the eCOGRA seal of approval for fair gaming. PokerTime employs data encryption technology to ensure the security of your financial information. PokerTime is powered by the online gaming software provider, Microgaming. The software is available in a downloadable version as well as a no download instant flash version. The software supports play in multiple languages including English, German, Swedish, Spanish, French and Danish. Players can choose from multiple games including Texas Hold’em, Omaha, 7 card stud and five card draw. There are also multiple tournaments including sit and go’s, multi table freerolls, multi table buy-ins and satellite tournaments. New players at PokerTime are eligible for a 100% match deposit bonus up to $200 on their first deposit. In addition, you will be given access to MyPokerLab, free state-of-the-art poker training and analysis software which you can use to improve your poker game. Players can win a share of $10,000 every week in the Points Challenge Leaderboard. If you refer a friend to Poker Time you will be awarded $25 for every friend that you refer. You can take part in the Survivor Tournament for your chance to win. All players who make a deposit at Poker Time will be eligible to play in the $250 freeroll tournament. Contestants can win €6,000 which includes $2,500 buy-in to Event 56, €1,000 for travel, 10 nights’ accommodation, €600 spending money and a €1,000 “last longest bet.” The players who last longest in Event 56 will be awarded a €10,000 package to the WSOP main event. 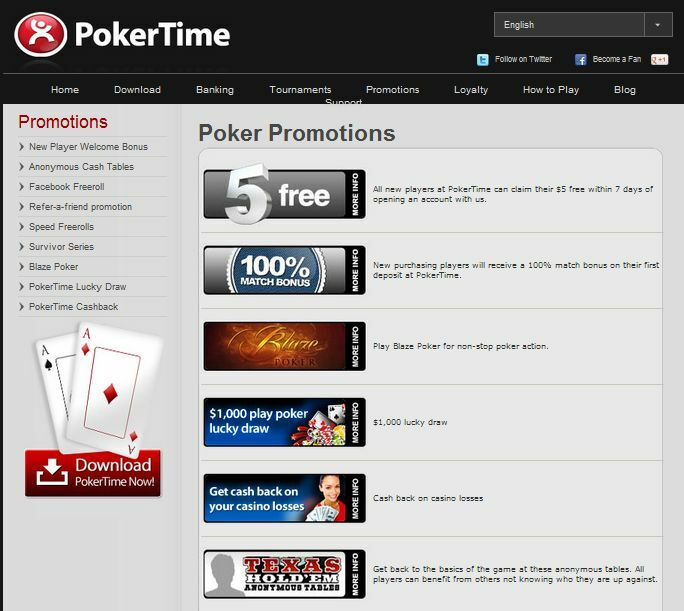 PokerTime runs a loyalty program with four tiers – bronze, silver, gold and platinum. Players are able to earn poker points and are eligible for extra benefits. Benefits include the ability to use poker points to buy into tournaments, a 24 hour support line, monthly reload bonuses, access to monthly MyPokerLab webinars and a VIP support line. If you have any questions when playing at PokerTime you can access the FAQ section on their website. If you do not find the answer to your question in that section, you can contact their customer service team which is available 24 hours a day, seven days a week. They can be contacted via email, telephone or instant live chat. Live chat support is only available in English, however other support is available in English, Spanish, Italian, French, Portuguese and German. 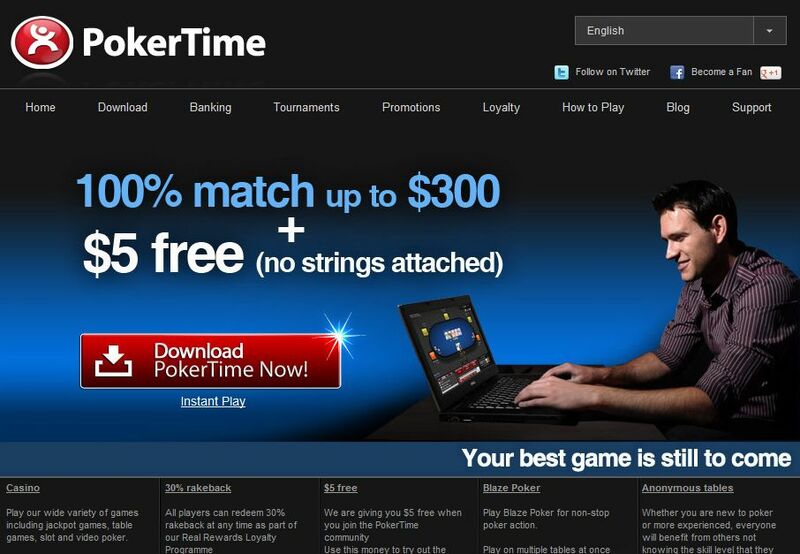 Players can make deposits into their PokerTime account via a number of safe and convenient methods. These include VISA, Master Card, PostePay, American Express, JCB, Diners Club, Maestro, VISA Electron, Solo, Switch, Delta, NETeller, Moneybookers, Click2Pay, Eco Card, ClickandBuy, EntroPay, EziPay, Paysafe Card, Ukash, InstaDebit, eCheck, direct bank transfer, iDEAL, Sofort, UseMyBank, Lobanet, UseMyWallet, Ticket Premium, CartaSi, Nordea and POLi. Transaction can be made in US dollars, UK pounds, euro and Swedish Kronor.